When you look at a Tropical Cyclone Oma from space, you’ll get a sense of its massive size. While orbiting the Earth, NASA-NOAA’s Suomi NPP satellite provided a look at the large tropical storm in the Southern Pacific Ocean. Oma weakened rapidly from a typhoon to a tropical storm, and on Feb 22, the Visible Infrared Imaging Radiometer Suite (VIIRS) instrument aboard NASA-NOAA’s Suomi NPP satellite captured a visible image of Oma. The VIIRS image also showed a long the bulk of clouds and thunderstorms pushed into the storm’s southern quadrant, looking like a large tail. That’s because northeasterly winds, or northeasterly vertical wind shear is pushing the clouds and tearing the storm apart. The Joint Typhoon Warning Center noted that rain bands, bands of thunderstorms that feed into the center, are unraveling, and the storm is elongating. Whenever a storm is no longer circular and elongates, it is a sign of weakening. At 10 a.m. EDT (1500 UTC) the Joint Typhoon Warning Center or JTWC noted that Oma’s maximum sustained winds dropped to 35 knots (40 mph). Oma’s center was located near 27.7 degrees south latitude and 159.9 east longitude, that’s approximately 367 nautical miles east of Brisbane, Australia. Oma has tracked south and is forecast to turn to the north and is expected to dissipate in a day or two. An infrared look by NASA’s Aqua satellite revealed where the strongest storms were located within the Southern Pacific Ocean’s Tropical Cyclone Oma. 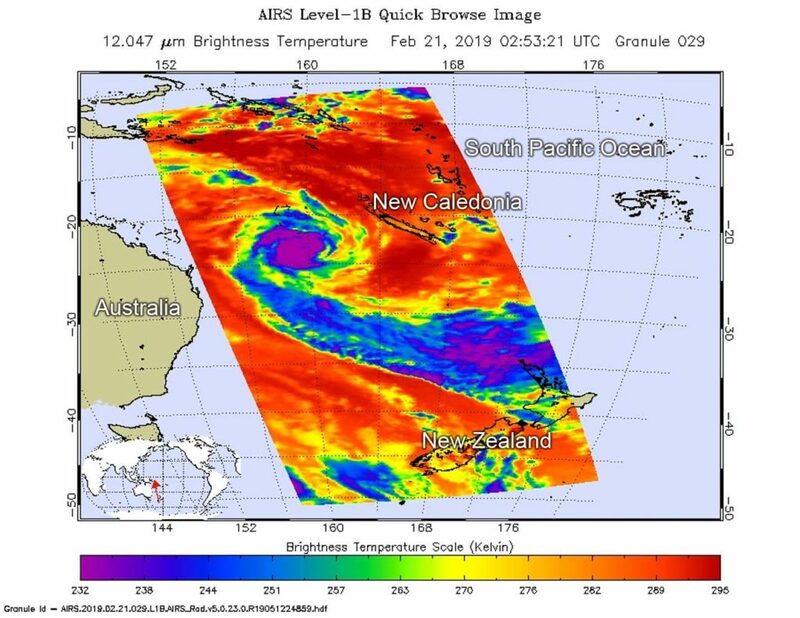 On Feb. 20 at 9:53 p.m. EDT (0253 UTC on Feb. 21) the Atmospheric Infrared Sounder or AIRS instrument aboard NASA’s Aqua satellite analyzed cloud top temperatures of Tropical Cyclone Oma in infrared light. AIRS found cloud top temperatures of strongest thunderstorms as cold as or colder than minus 63 degrees Fahrenheit (minus 53 degrees Celsius) circling the center. Cloud top temperatures that cold indicate strong storms that have the capability to create heavy rain. Cloud top temperatures over the bands of thunderstorms feeding into the low-level center have warmed. That’s indicative of a weakening storm. The higher in the atmosphere, the colder the cloud top. When cloud tops warm, it means the uplift of air that pushes them, has weakened. 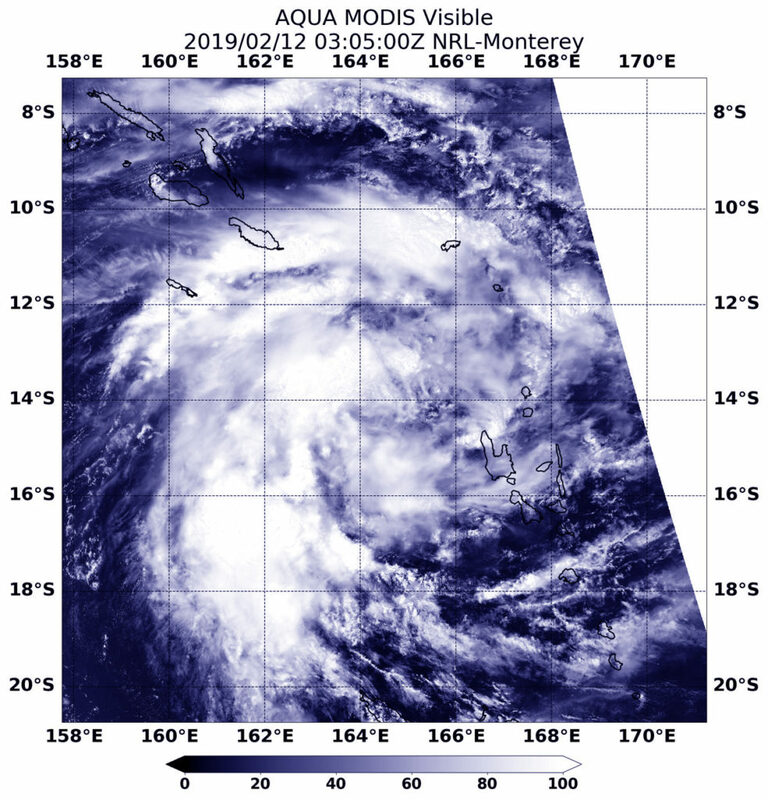 On Feb. 21 at 10 a.m. EST (1500 UTC), the center of Tropical Cyclone Oma was located near latitude 24.1 degrees south and longitude 159.7 degrees east. That’s about 418 nautical miles east-northeast of Brisbane, Australia. Oma was moving to the south. Maximum sustained winds were near 45 knots (52 mph/83 kph). The Joint Typhoon Warning Center expects Oma to become slow moving and dissipate after two or three days because of increasing wind shear and movement over cooler sea surface temperatures. 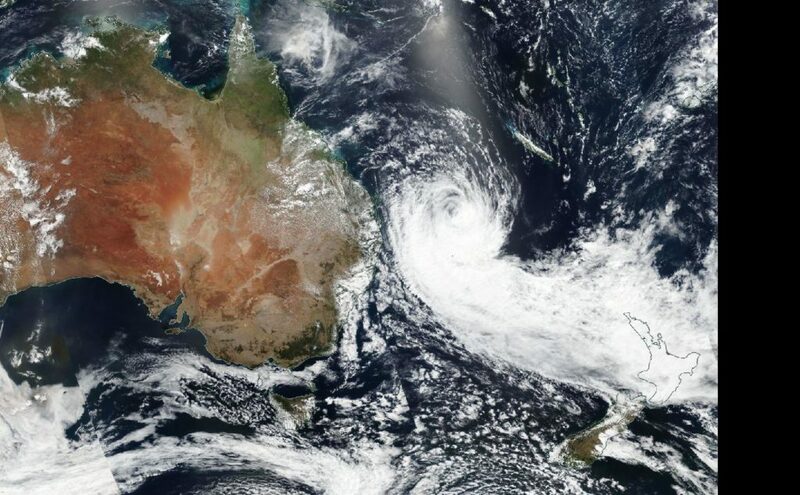 Tropical Cyclone Oma is a large hurricane with a big eye. The storm appeared well-organized on satellite imagery as it moved through the Southern Pacific Ocean. On Feb.20, the Visible Infrared Imaging Radiometer Suite (VIIRS) instrument aboard NASA-NOAA’s Suomi NPP satellite provided a visible image of Tropical Cyclone Oma. VIIRS revealed a large eye surrounded by powerful thunderstorms. The JTWC noted that the system is struggling to intensify due to the large size of the eye. The VIIRS image also showed a long band of thunderstorms wrapping into Oma’s low level center from the southern quadrant, giving the impression of a long tail. Oma is located west of New Caledonia and east of Queensland, Australia. At 10 a.m. EDT (1500 UTC) the Joint Typhoon Warning Center or JTWC noted that Oma’s center was located near 22.1 degrees south latitude and 160.6 east longitude, that’s approximately 545 nautical miles northeast of Brisbane, Australia. Oma has tracked south-southwestward. Oma is forecast to turn to the west-northwest on Feb. 24 and pass near Cato Island. 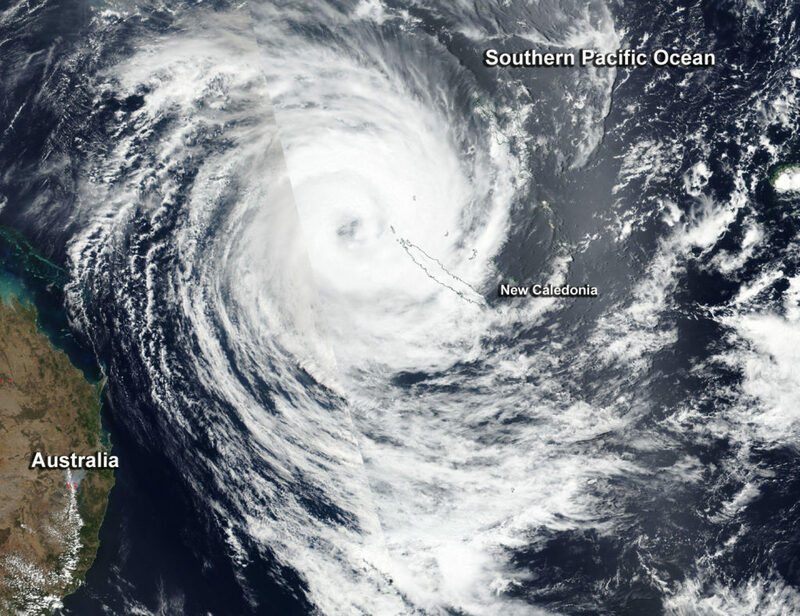 Tropical Cyclone Oma appeared well-organized on satellite imagery as it moved through the Southern Pacific Ocean, just northwest of New Caledonia. On February 19, New Caledonia posted a tropical cyclone alert level 2 for the communities of Belep, Hienghene, Kaala-Gomen, Koumac, Ouegoa, Ouebo and Poum. New Caledonia is a French territory that consists of dozens of islands in the South Pacific Ocean. It ls located about 750 miles (1,210 km) east of Australia. On Feb.19, the Visible Infrared Imaging Radiometer Suite (VIIRS) instrument aboard NASA-NOAA’s Suomi NPP satellite provided a visible image of Tropical Cyclone Oma that revealed an eye surrounded by powerful thunderstorms. Oma’s southeastern quadrant covered New Caledonia. The northern tip of the island was close to Oma’s eyewall. At 10 a.m. EDT (1500 UTC) Oma’s maximum sustained winds were near 75 knots (86 mph/139 kph). Oma’s eye was located approximately 246 nautical miles west-northwest of Noumea, New Caledonia, near 20.6 degrees south latitude and 162.0 east longitude. Oma was moving to the south. 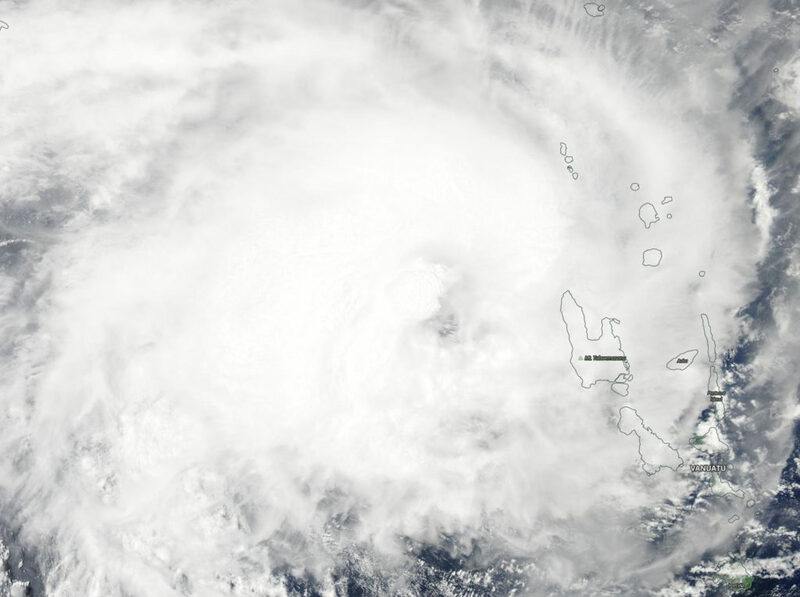 Tropical Cyclone Oma continued to stay just west of Vanuatu in the Southern Pacific Ocean as NASA-NOAA’s Suomi NPP satellite passed overhead and captured an image of the tropical storm. NASA-NOAA’s Suomi NPP satellite passed over the Southern Pacific Ocean and captured a visible image of Tropical Cyclone Oma on Feb. 15 when it was passing west of Vanuatu. Credit: NASA Worldview, Earth Observing System Data and Information System (EOSDIS). Suomi NPP passed over Oma on Feb. 15 and the Visible Infrared Imaging Radiometer Suite (VIIRS) instrument provided a visible image of the storm. The VIIRS image showed a large area of thunderstorms wrapping into the center. Most of the convection (rising air that condenses and forms clouds and thunderstorms that make up a tropical cyclone) is north of the center. Oma was passing to the west of Vanuatu. Visible imagery from NASA’s Aqua satellite revealed the center of Tropical Cyclone Oma was just northwest of the island of Vanuatu in the South Pacific Ocean. Vanuatu consists of roughly 80 islands that stretch about 808 miles (1,300 kilometers). The Vanuatu Meteorology and Geo-Hazards Department (VMGD) issued Tropical Cyclone Warning Number 18 for the Torba, Sanma, Penama and Malampa Provinces. Those provinces can expect heavy rainfall and flash flooding over low lying areas and areas close to the river banks. In addition, coastal flooding will continue. The Vanuatu National Disaster Management Office (NDMO) noted that a red alert remains in force for Torba, Sanma, Penama and Malampa provinces, while yellow alert is in effect for the Shefa province. 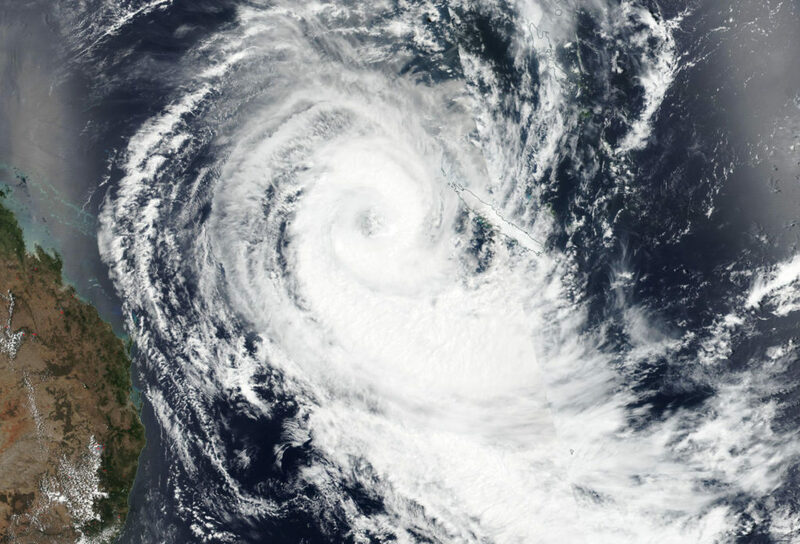 On Feb. 14, 2019, the Moderate Resolution Imaging Spectroradiometer or MODIS instrument aboard NASA’s Aqua satellite captured a visible image of Tropical Cyclone Oma. The image showed Oma’s center northwest of Vanuatu. The image revealed a large area of bands of powerful thunderstorms wrapping into the low level circulation center, with most convection (rising air that forms the clouds and thunderstorms that make up the tropical cyclone) displaced to the north of the low-level center. The Joint Typhoon Warning Center expects Oma to continue to move away from Vanuatu in a southwesterly direction. 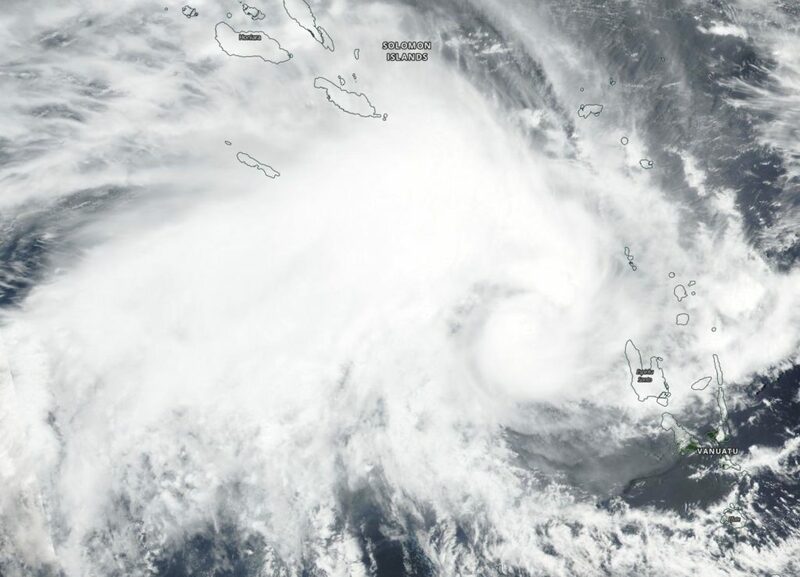 Tropical Cyclone Oma continued to move southeast in the Southern Pacific Ocean, and continue affecting Vanuatu. NASA-NOAA’s Suomi NPP satellite provided a visible image of the storm. 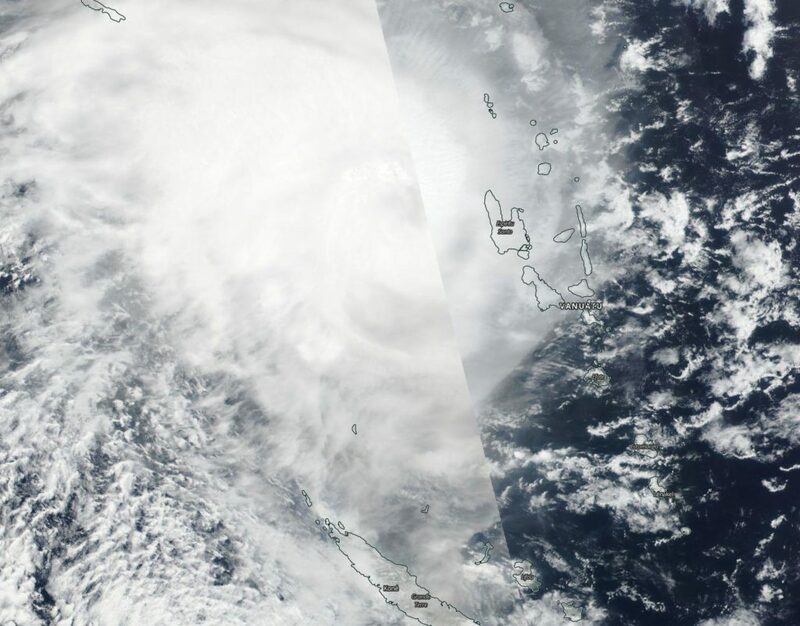 NASA-NOAA’s Suomi NPP satellite passed over the Southern Pacific Ocean and captured a visible image of Tropical Cyclone Oma on Feb. 13 as it approached Vanuatu. Credit: NASA Worldview, EARTH Observing System Data and Information System (EOSDIS). Suomi NPP passed over Oma on Feb. 13 and the Visible Infrared Imaging Radiometer Suite (VIIRS) instrument provided a visible image of the storm. The VIIRS image showed a circular center of thunderstorms with a large, wide band of thunderstorms wrapping into the center from the northwest. That’s because the storm is experiencing easterly winds that are pushing clouds west and away from the center. The image also showed the southeastern quadrant already over Espiritu Santu, Vanuatu. The Joint Typhoon Warning Center (JTWC) noted on Feb. 13 at 4 a.m. EDT (0900 UTC) that Oma was near 14.6 degrees south latitude and 165.2 east longitude, about 262 nautical miles northwest of Port Vila, Vanuatu. Maximum sustained winds were near 45 knots (52 mph/83 kph). Oma was moving to the west-southwest. Forecasters at the Joint Typhoon Warning Center noted that Oma is expected to strengthen over the next day as it begins curving to the south. By February 15, as Oma takes more of a southwesterly turn and heads away from Vanuatu and toward northern New Caledonia, increasing wind shear and movement over cooler waters will weaken the storm. NASA’s Aqua satellite passed over the Southern Pacific Ocean and captured a visible image of Tropical Cyclone Oma. Oma formed northwest of Vanuatu. On Feb. 12 at 0305 UTC (Feb 11 at 10:05 p.m. EDT) the Moderate Resolution Imaging Spectroradiometer or MODIS instrument aboard NASA’s Aqua satellite provided a visible image of Tropical Cyclone Oma. Satellite imagery showed Oma’s center between the Solomon Islands to the northwest and Vanuatu to the southeast. The bulk of Oma’s clouds were west of the center of circulation. At 10 a.m. EDT (1500 UTC) the center of Oma was located near latitude 13.8 degrees south and longitude 165.6 degrees east. That’s about 289 nautical miles northwest of Port Vila, Vanuatu. Oma was moving to the east. Maximum sustained winds were near 45 knots (52 mph/83 kph) and Oma is forecast to strengthen slightly over the next two days before weakening.